S is for Sunshine and Saltwater. These two things are very important where I live. It's probably more accurate to say they're important anywhere. I mean, who doesn't need sun and water? Living in the Pacific Northwest, Sunshine is sometimes elusive. At least from November to May, some people say. I say that fact is changing. Sometimes that's true and sometimes not; now, for often than not, it's not. But we are still famous for our higher rainfall and grayer skies. But we're also known for our greener forests and urban landscapes and fields. Those are made by rainfall. So as much as people might whine about the grey skies and water coming down from those grey skies, the result can be pretty amazing to look at, hike through, bike across, and so on. Sunshine is another factor in the growth of greenery. It is also a factor in Vitamin D for the body. Which we all need. Some of us more than others. I've heard it said that those of us who've spent massive times living in that same Pacific Northwest should take more Vitamin D; some of us do, some don't. But this morning it is a very sunny day. Yesterday was cloudy and drizzly. Today I woke up to sunshine and not a hint of a cloud that I can see. (Though if I put my glasses on I suspect there are wispy remnants.) So Sunshine was the first S word that popped into my head. And, as has happened several times, as I was typing in my title, the second important S word, Saltwater, joined in. I live in Portland, Oregon. One awesome thing about living here is that we have the mountains for skiing or hiking within an hour drive; the desert a couple of hours away; rivers for paddling/wind surfing/parasailing/boating and more within minutes to a few hours, and we have the ocean in less than two hours. I love all of the other places, but going to the beach is my place of rejuvenation. For those who've never been here, I know that "beach" brings up images of sun and sand and tans and maybe skimpily clad surfers. Not so true here. Sometimes you can do that, but it tends to be colder, and there's more wind, and going into the water requires some fortitude or a wetsuit - the water is cold, most of the time. But the beach is beautiful. Miles and miles of it. And the scenery. The smells. The sounds (away from the more populated areas, at least). S is for Sunshine and Saltwater. I'm grateful for both. 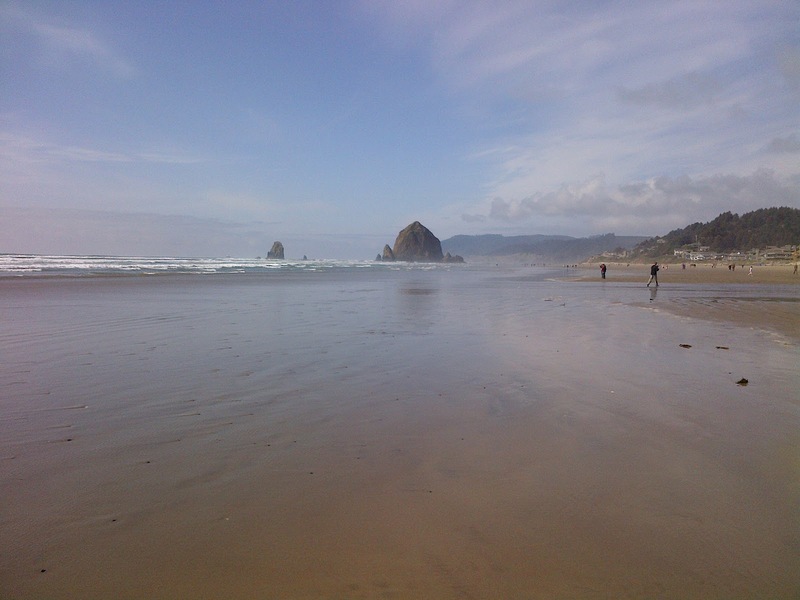 Cannon Beach photo by Dot. I live surrounded by the sea and beaches. They are 10 minutes drive from where I live and there are very few locations throughout the entire country where it takes long to arrive at one. That sounds lovely. I can't imagine living where you couldn't get to the ocean within a couple of hours. I know there are people who live in landlocked areas and they're fine - but I need access to big bodies of water.